I’m really looking forward to Saturday night and Sunday services at Warwick Assembly this weekend! If there’s any dryness in your life, or if you are just desperate for more of God, come and join us. Our anthem of late comes from Bethel Music’s “Deep Cries Out,” and we sing, “I’ve got a river of living water, a fountain that never will run dry.” That is an awesome reality! Come catch the excitement! 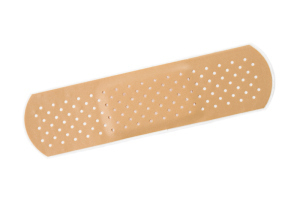 Think about it: did that little piece of first-aid wonder actually do any measure of healing? In our naiveté it did. But, we understand now that the band-aid only hid the wound from our sight (and from some germs). It masked the injury, but the healing truly came from the inside.